Malcolm and Jacqui got married at Kings Norton Church and had their massive 300-person wedding reception at Kings Norton Golf Club. I had spent the morning with Jacqui and her bridesmaids who were getting ready in a local hotel. During our pre-wedding meeting at the venue, we had carefully worked out all the timings for the day so I could capture images of both Jacqui and Howard getting ready at different locations. Howard and his best man were getting ready at the bride and groom's house. 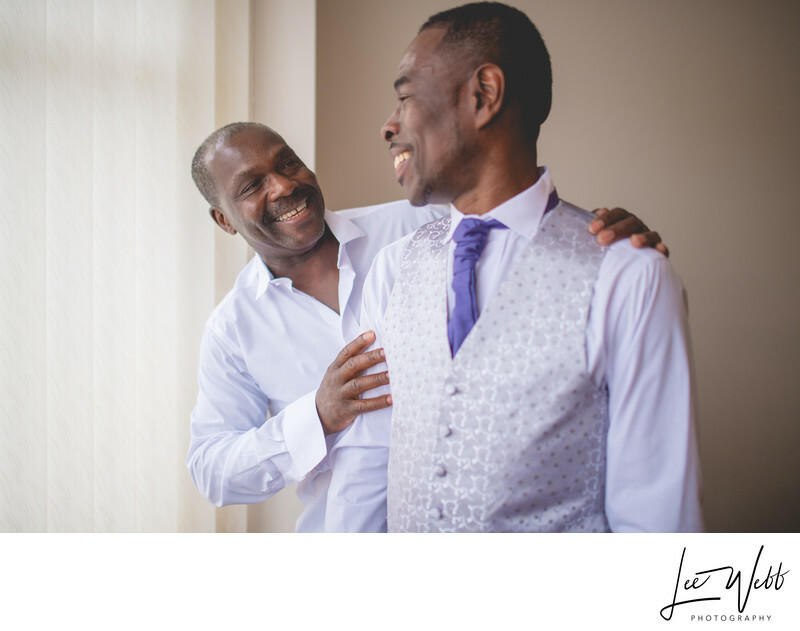 Howard chose to get ready in his living room as it provided ample space for both himself and his best man at the same time. The benefit for me was that the front bay window to the living room was enormous, and a white blind that was drawn across the window acted like a massive photographic soft box, which produced beautiful lighting. Malcolm seemed anxious on the morning of his wedding, and at times he struggled visibly with his cufflinks and tying his cravat. Luckily his best man was always on hand to help him with these things. Once Malcolm was just about ready, his best man took a second to reassure him that everything was going well and that they had plenty of time and no need to rush. It was a beautiful moment between the two, and I made sure I was in the right place to capture this image at the perfect time.